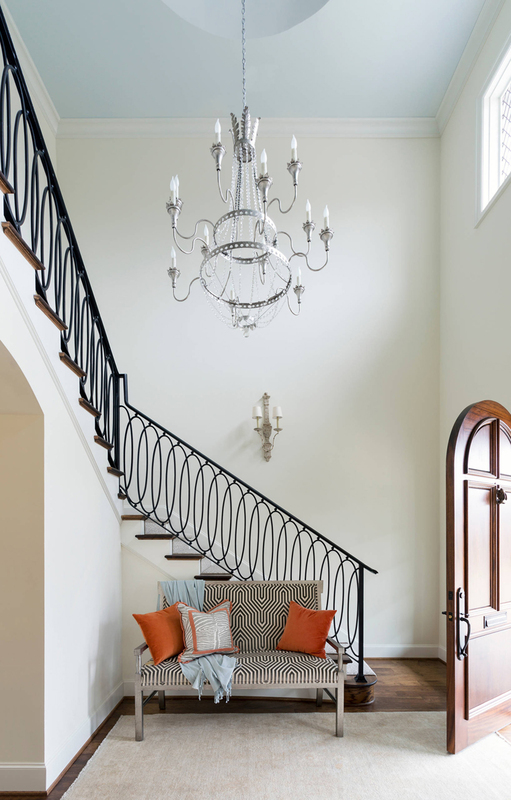 This Fort Worth, Texas home designed by Heather Scott Home & Design has it all! 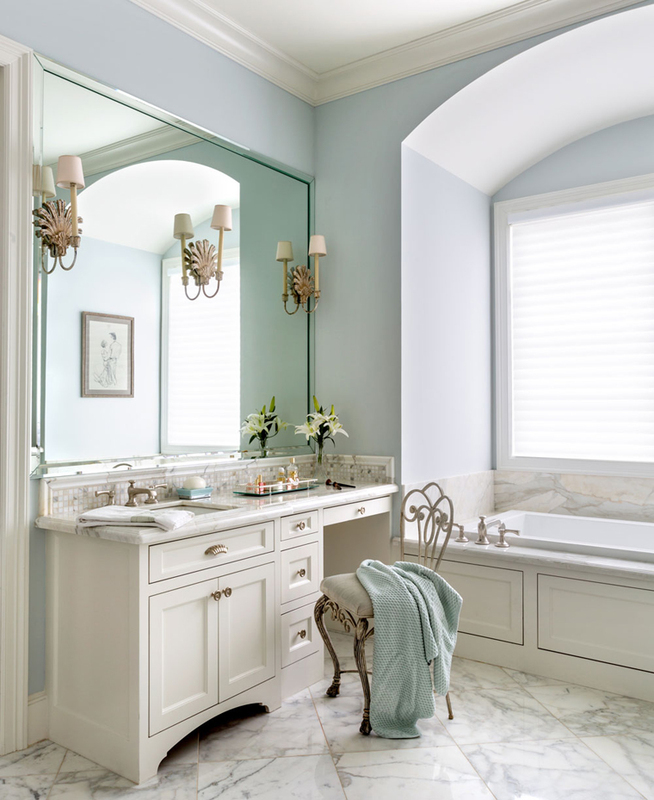 The Georgian-style manor was designed with balance and proportion but furnished with a lighthearted and happy color scheme that I adore. 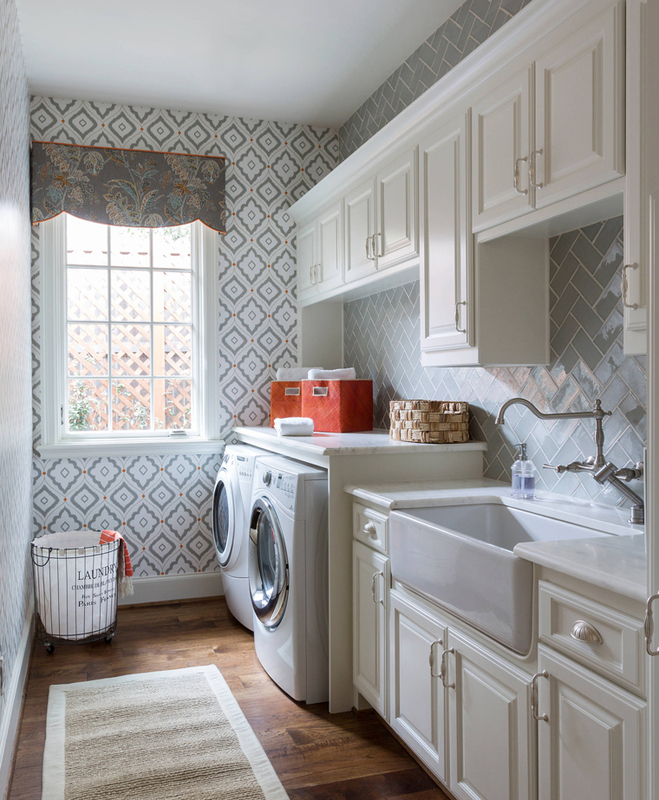 Intricate architectural details and playful prints throughout give the home (captured beautifully by Nancy Nolan) a sophisticated yet fresh, upbeat vibe. 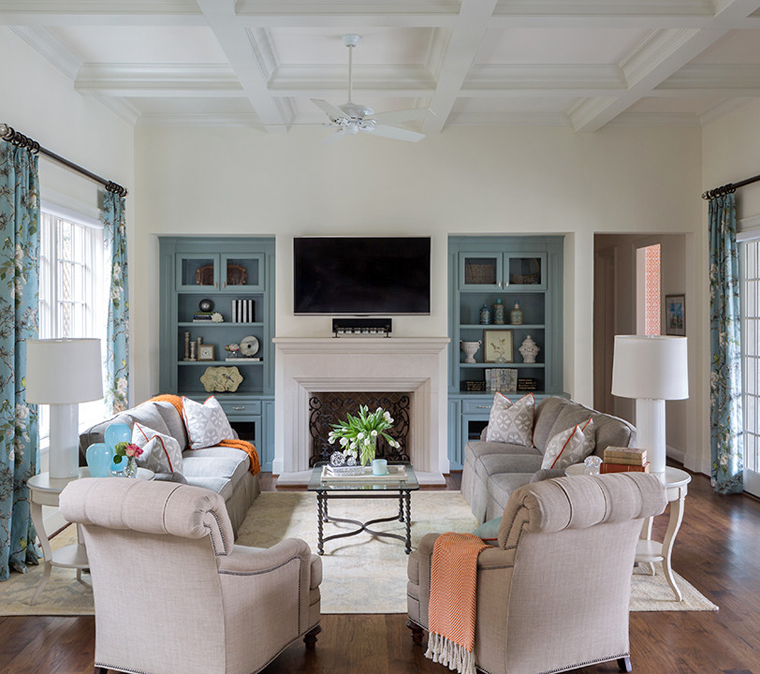 The media room above is absolutely gorgeous and one of my favorite spaces. 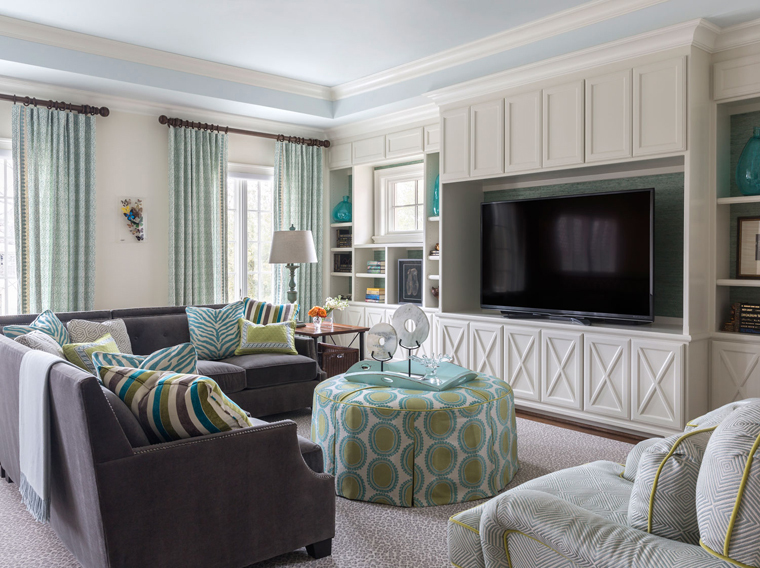 The built-in unit backed with turquoise grasscloth makes such a great statement! 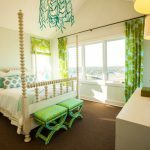 Loving the turquoise drapes, ottoman, and fun mix of pillows too. There’s so much more to see…keep on scrolling! 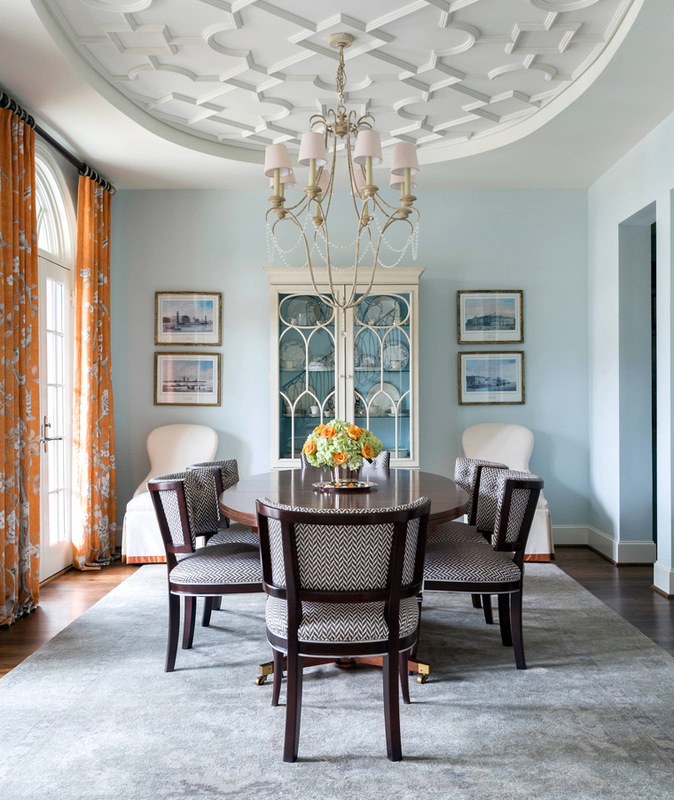 Loving the orange and blue accents and clever mix of patterns in the dining area. 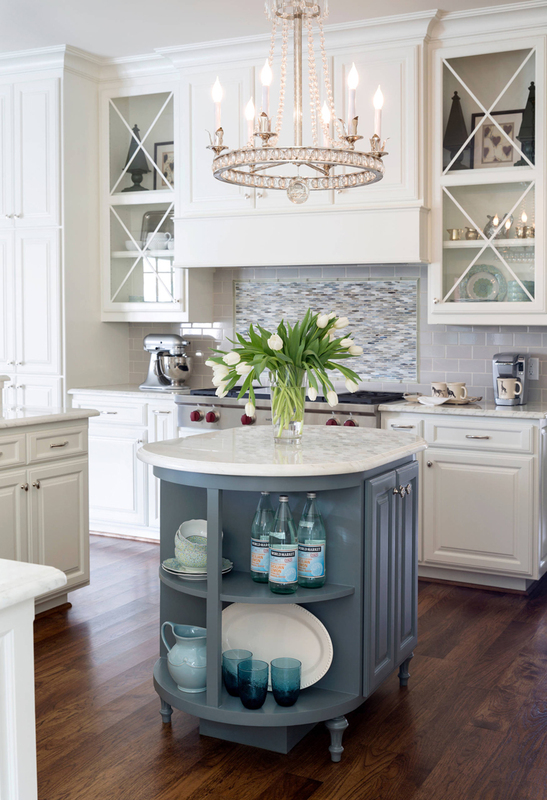 The island painted Benjamin Moore’s “Gibraltar Cliffs” adds a splash of color to the space. 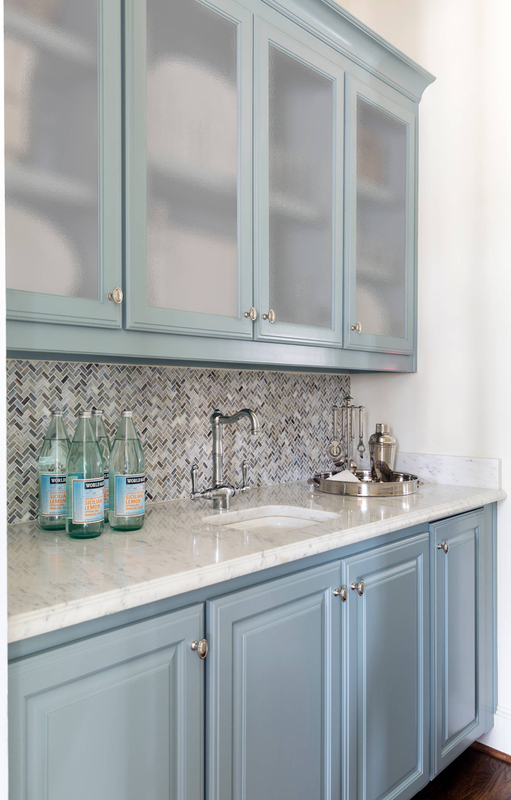 Such a chic butler’s pantry. 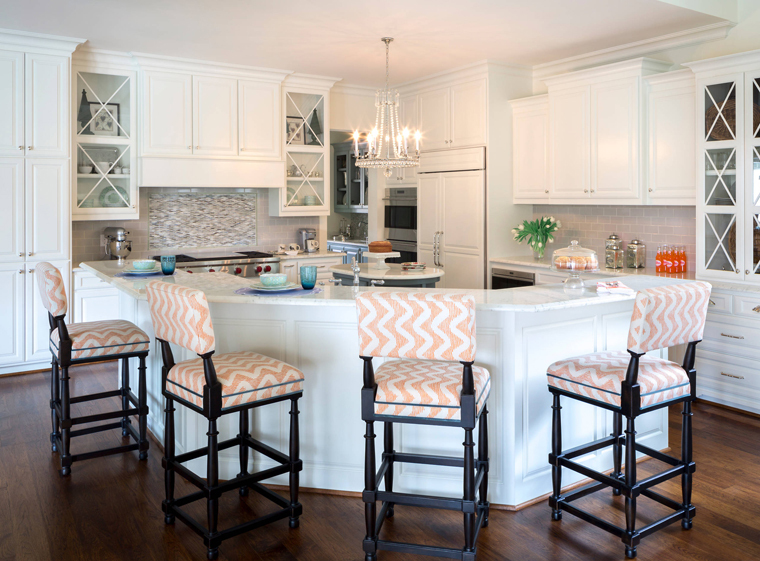 Cabinets are painted Benjamin Moore “Kentucky Haze”. 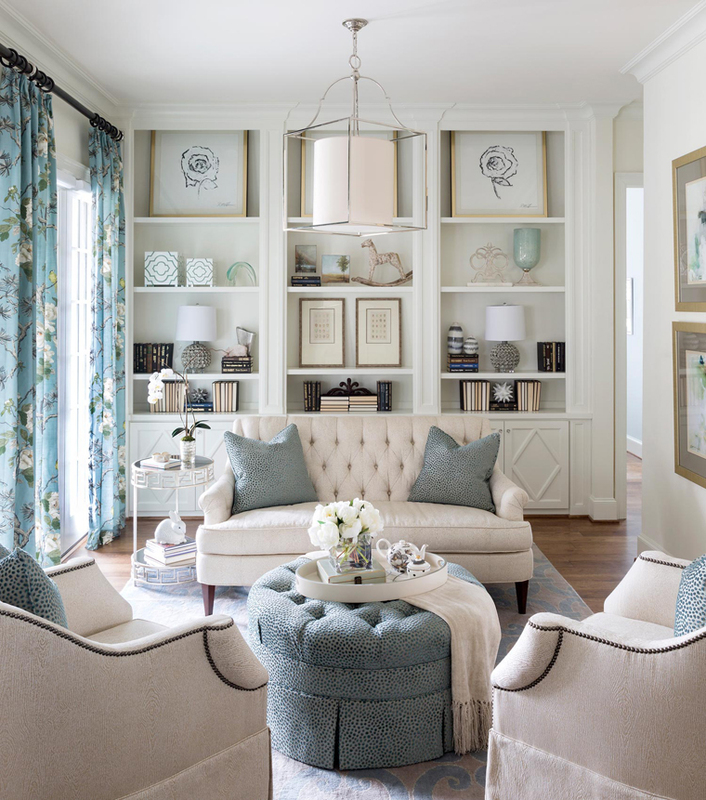 The family room is as comfortable as it is beautiful. 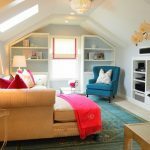 Love the blue built-ins, also painted “Kentucky Haze”. 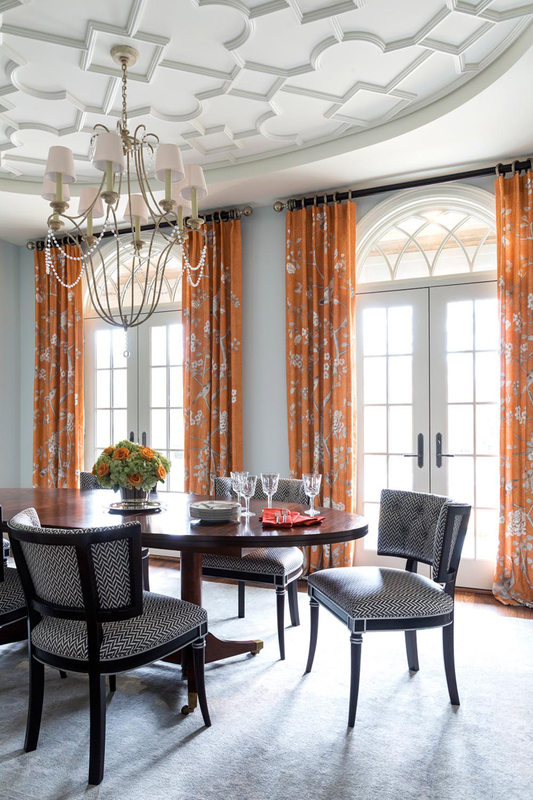 The orange and blue flows to the formal dining room. The ceiling is incredible! 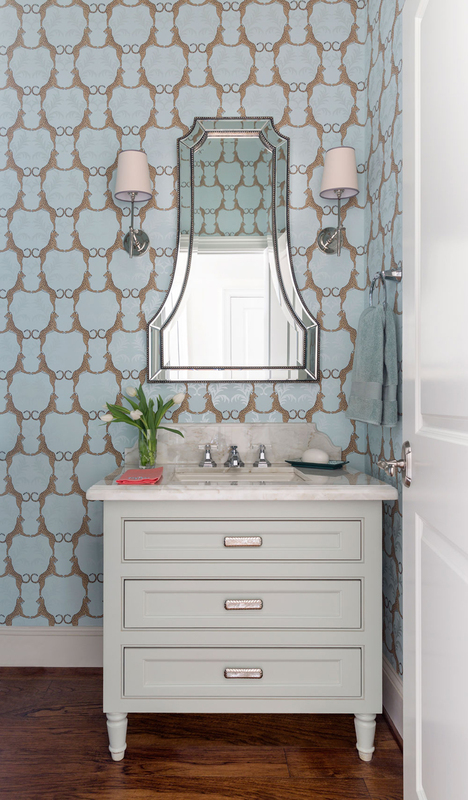 This elegant powder bath packs a punch with Thibaut’s Cheetah wallpaper. 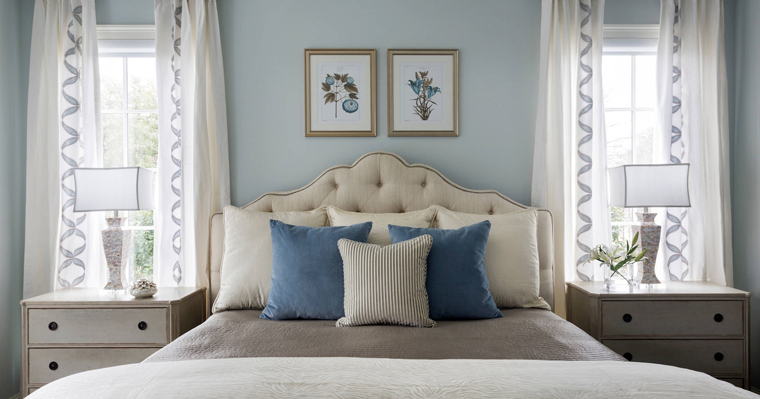 Such a beautiful and serene master bedroom painted Benjamin Moore’s “Glass Slipper”. 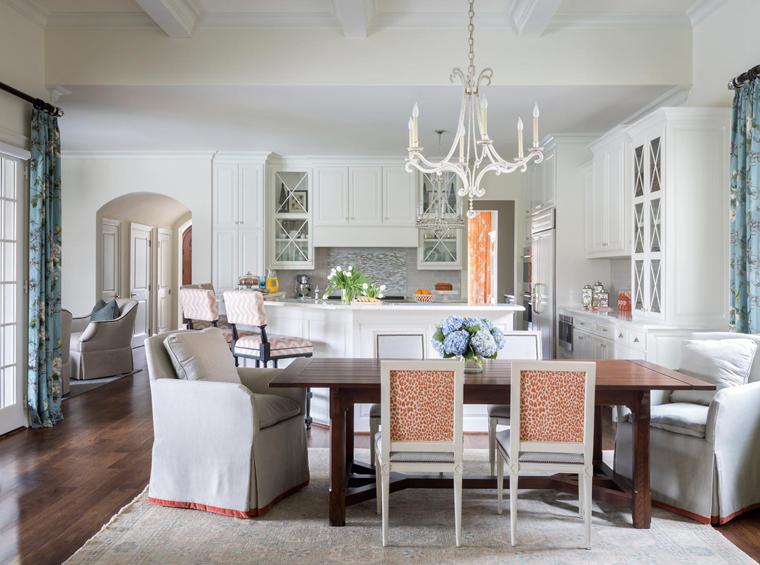 See more photos of the home right over here, and be sure to check out the designer’s entire portfolio here. 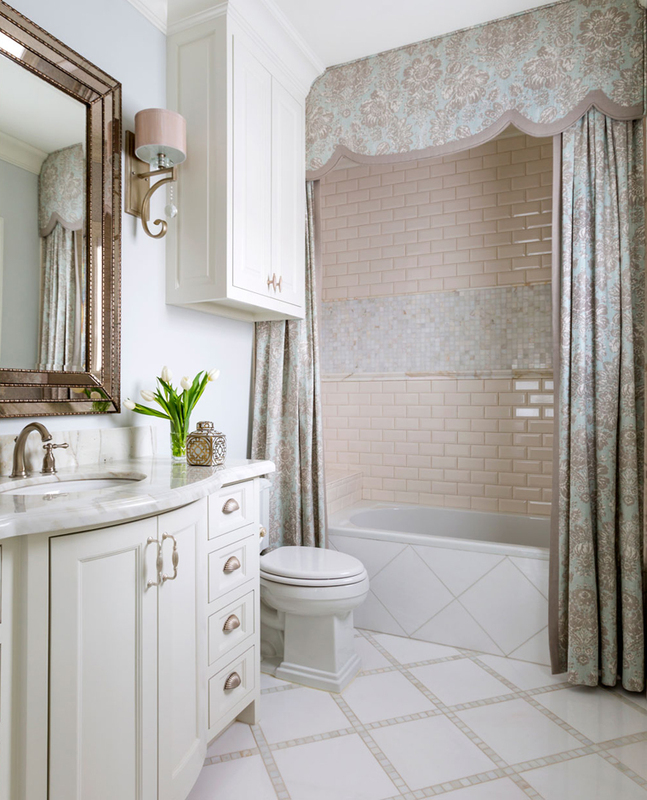 For even more inspiration, be sure to follow Heather Scott Home & Design on Instagram and visit their blog. 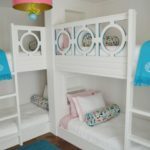 They have an online store and boutique in Austin, TX too! 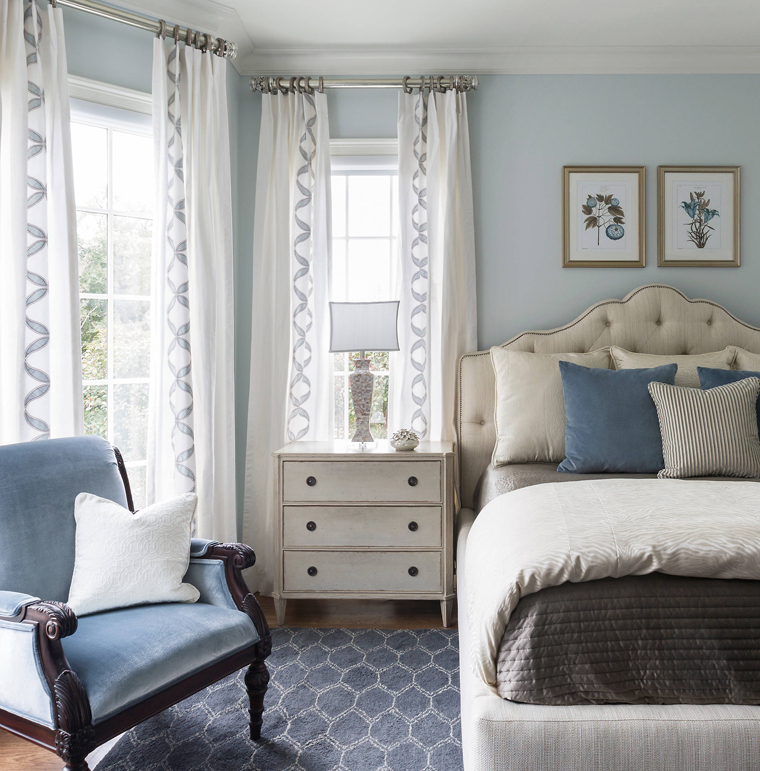 For a few more inspiring projects I’ve featured by Heather Scott Home & Design, go here next! 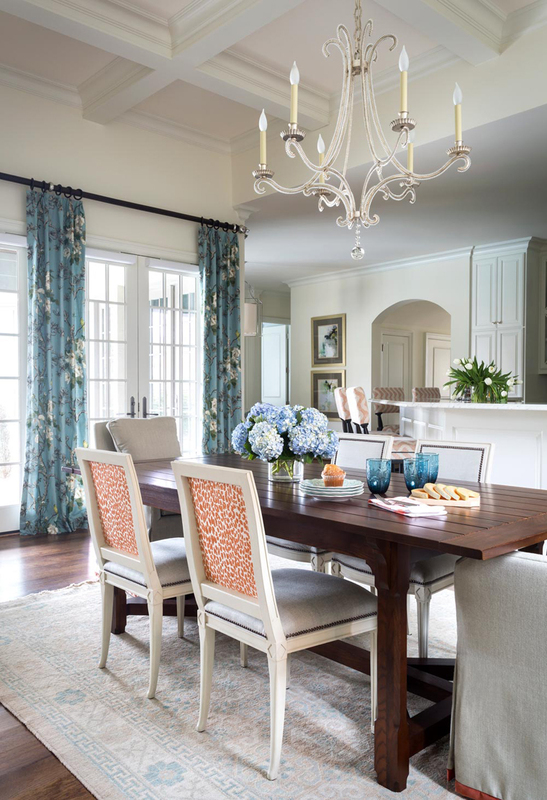 Can you tell me the name of the drapery fabric used in the dining area off the kitchen? 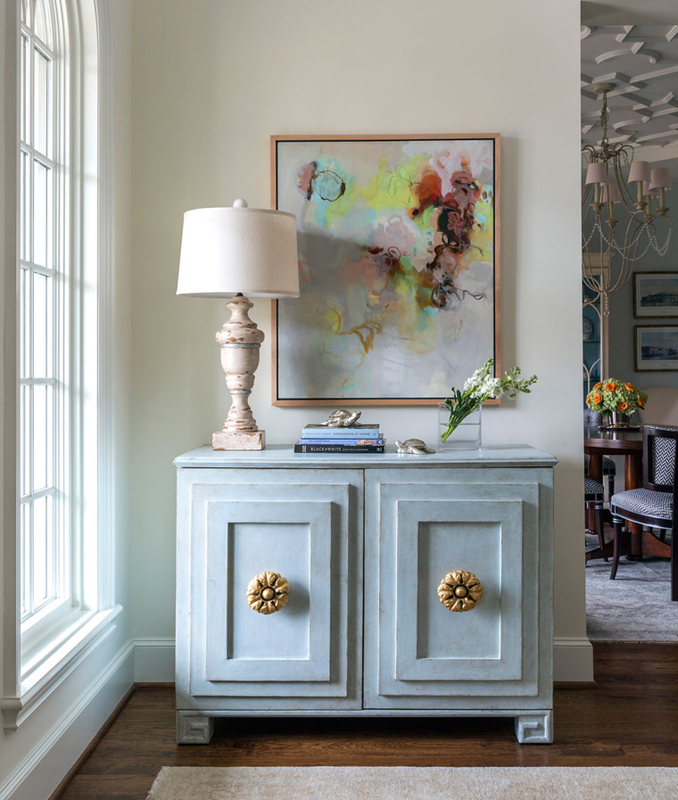 Does anyone know the source for that gorgeous blue chest with the gold knobs? It looks like it’s in a hallway or foyer? Thank you.